We ship to over 120 countries in the world at last count, regular shipments of our low cost diesel fuel test kits go to countries like the USA, UK, Australia, New Zealand, UAE, Saudi Arabia, Canada, Ireland, Russia, Norway, Sweden, Denmark, Nigeria, Oman to name just a few. If you have contaminated diesel fuel or suspect that may have then our low cost diesel testing kits we have may be just what you are looking for. A health hazard to your diesel engine. A major cause of engines stopping at the worst possible moment. A key factor in costly repairs to your engines fuel system. 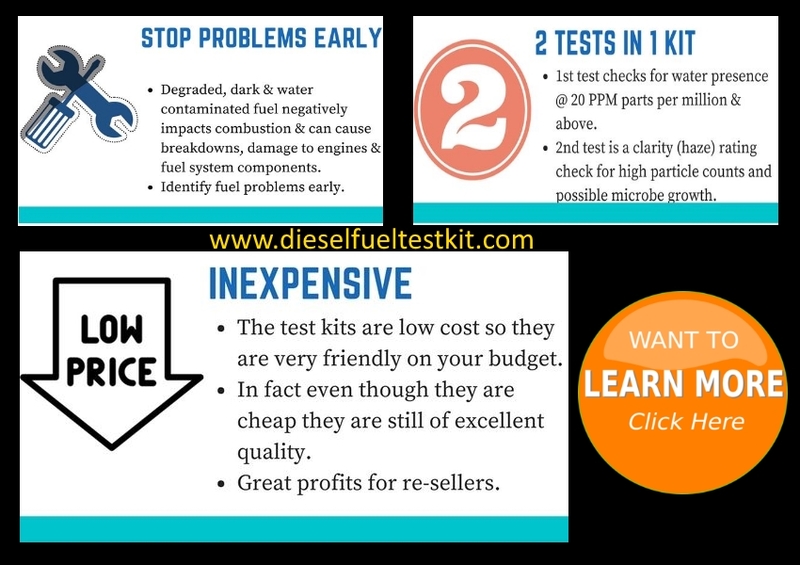 Contact us for online quotes of our diesel fuel test kits. When water is present in your diesel fuel well it’s pretty much a breeding ground for all sorts of nasty bugs. As your fuel tank heats up and cools down water will condensate on the inner walls and drop into your fuel. This water in your diesel may eventually lead to Microbial growth like Algae, Fungus, Mould and other living spores that love to grow in diesel fuel. Yes this is true, In the first instance these bugs are microscopic in size but will quickly grow into large cells that can cause you massive problems. The major points to keeping your diesel fuel healthy so as to not cause you problems are keeping your fuel in good condition. Regular monitoring is the first step in any good maintenance program, if water in your fuel is detected you may need to drain the tank or filter water sediment bowls or add a fuel treatment to breakdown the water and kill any bugs that you may have. Should you have a major bug problem adding a treatment may well destroy any bugs but these bugs when treated may well just also plug your filters so have spare filters on hand if you undertake a treatment on a fuel system with major Microbial problems. 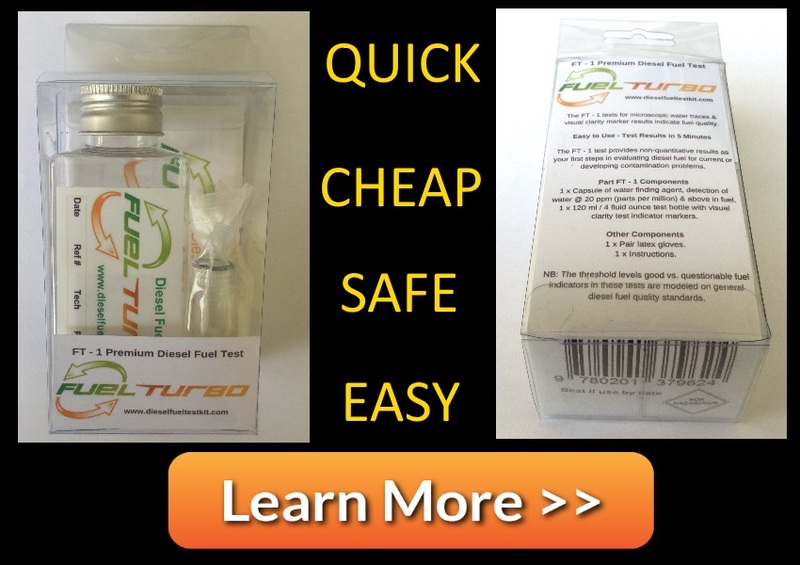 The first defense in fuel problems is to test for any issues, our popular test kits can be used in the field by pretty much anyone. They are not hazardous and our 100% friendly to the environment. We have several different test kits available that start in price from just $4.95 for a complete test. Our FT-Combo test kit is the ultimate in field testing which checks for both water and bacterial issues in your fuel. 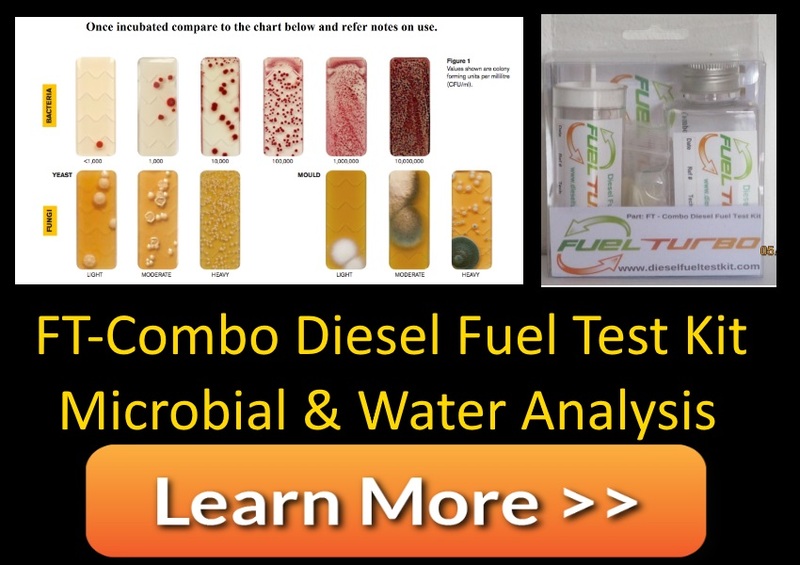 Contact us for online quotes of our diesel fuel bacteria test kits. NB – these test kits are not a substitute for a complete laboratory analysis, they are intended to be used as a first step in evaluating your diesel fuel quality. Identifying diesel fuel with contamination problems is the easy part with our test kits, what to do next can be the harder part. Depending on bad your bug problems are, your fuel may need to be removed and disposed of and the tanks may need to be pressure washed to remove all traces of contamination. You will need to replace all filters and then refill with new fuel. In some areas you may find companies that specialize in fuel cleaning commonly known as “fuel polishing” these services don’t come cheap.